This popular spacious 2.5 bedroom house with charming nooks and corners is the most wonderful magic place for bigger families with children of all ages or groups of friends meeting for a special experience in nature. The cottage is surrounded by an established English garden filled with fragrant plants and flowers and many places to just sit and be. 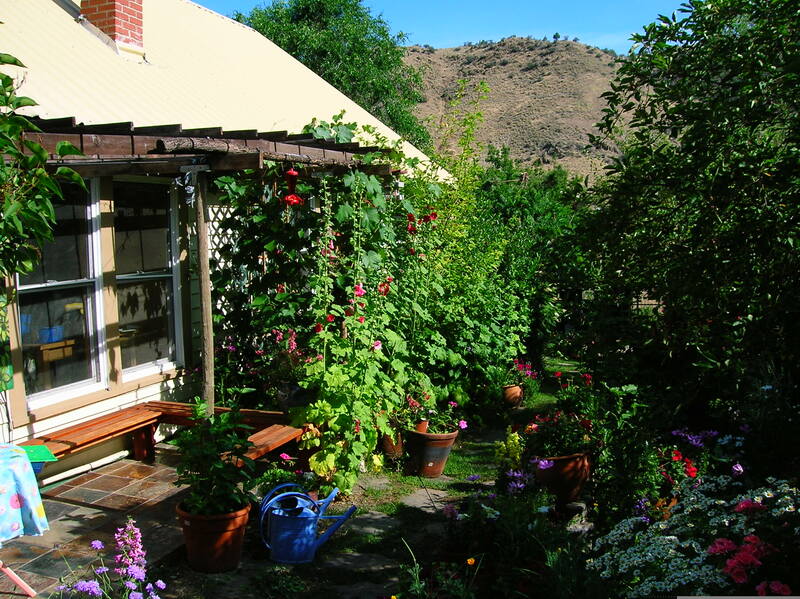 The Painted Hills Cottage, surrounded by an exceptional garden can sleep six people. 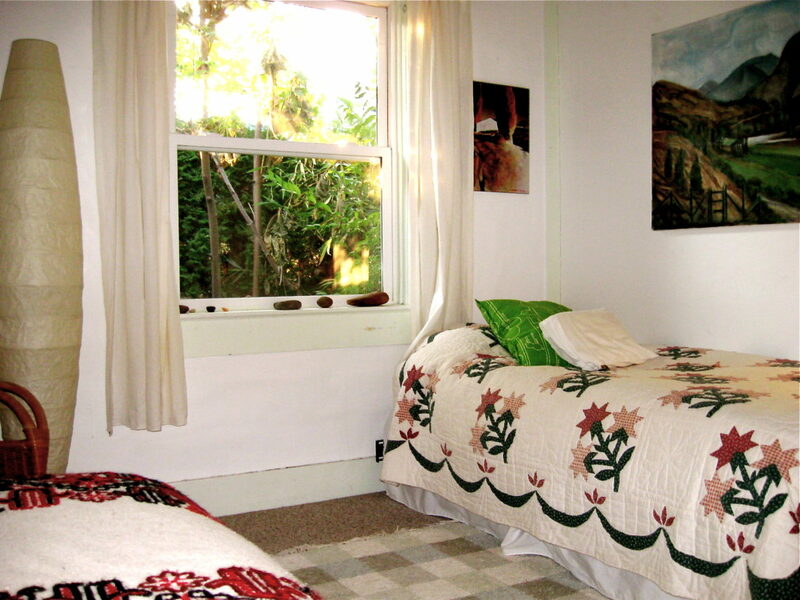 It has two and ½ bedrooms furnished with comfortable queen and full-size beds as well as a sofa hide a bed. 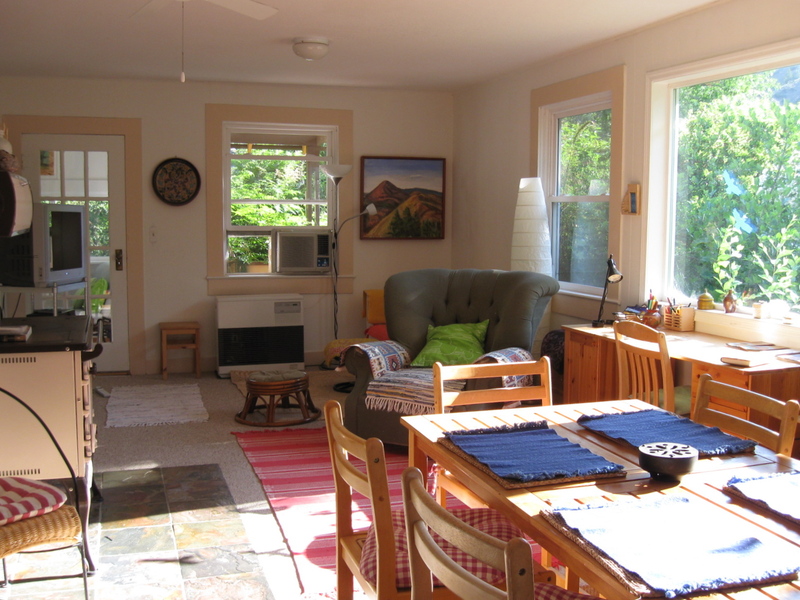 The spacious living room/dining room is flooded with light and features comfortable furniture, an extra sofa hide bed, a wonderful old wood stove, a TV with a DVD/VCR player, and a writing desk. For your entertainment, we also offer you a great selection of foreign, classic, and award-winning movies. 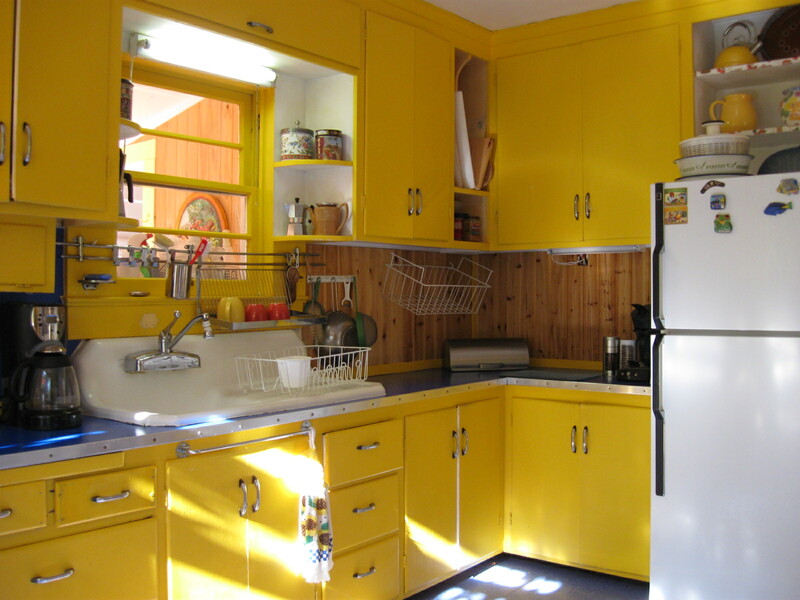 The country style kitchen is bright and sunny. It is well stocked with all the equipment you need to whip up something special and to enjoy cooking. We provide you with the basic condiments, fine herbs, and ethnic spices, as well as gourmet cookware. The bathroom has been remodeled and features a spacious walk-in shower with a powerful rain-shower head, and custom built wood cabinets. 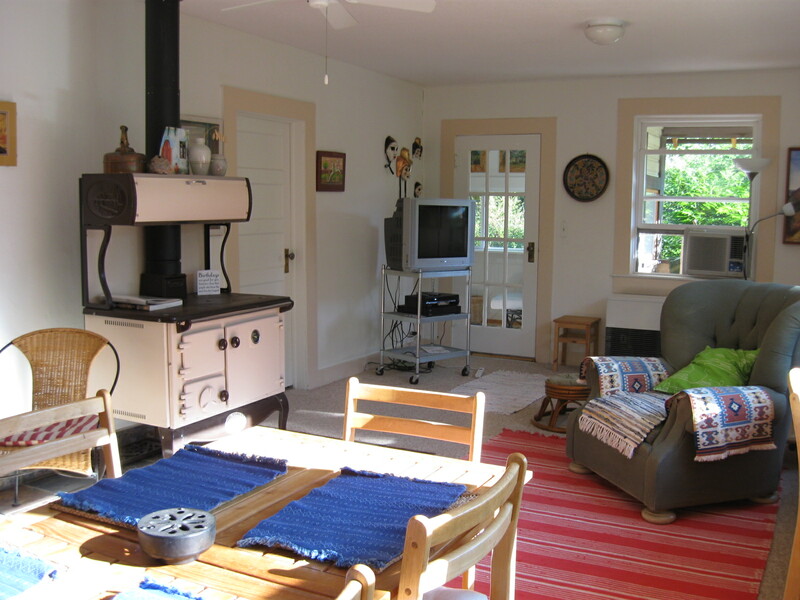 The barn has been remodeled into a game room that connects the two vacation cottages, and is available to hang out, play games, or lay on the comfy couch to watch movies on an extra TV/VCR set. The garden has an outdoor dining area with a shade providing umbrella. 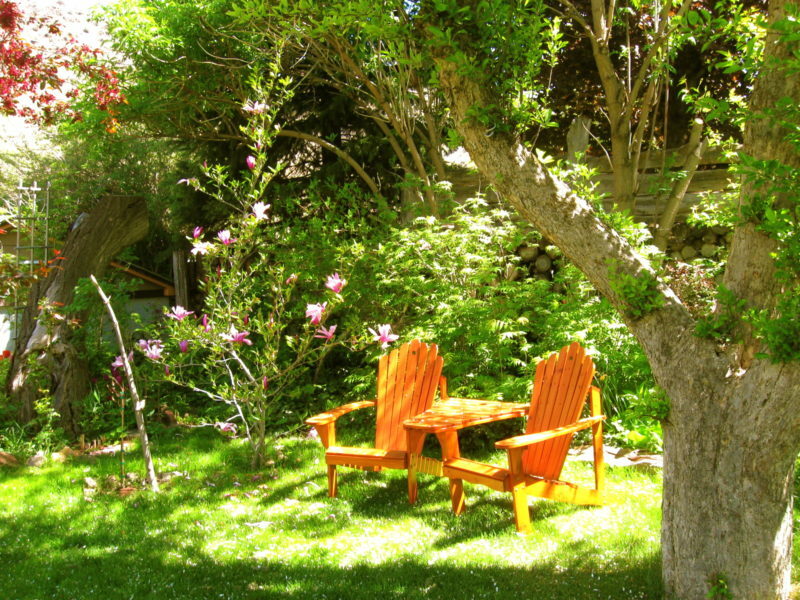 Garden lawn chairs and benches placed throughout the garden are provided for your leisure. Shoe shelves, wash machine, laundry sink, cleaning supplies, laundry detergent A dryer is available in a separate laundry room behind the barn room upon request. Clotheslines with pins are in the garden. Bedroom 2: 1 queen size bed, 1 Twin bed, both with excellent new mattresses, European down comforters, fluffy pillows, drawers, linens provided, reading chair and lamp. 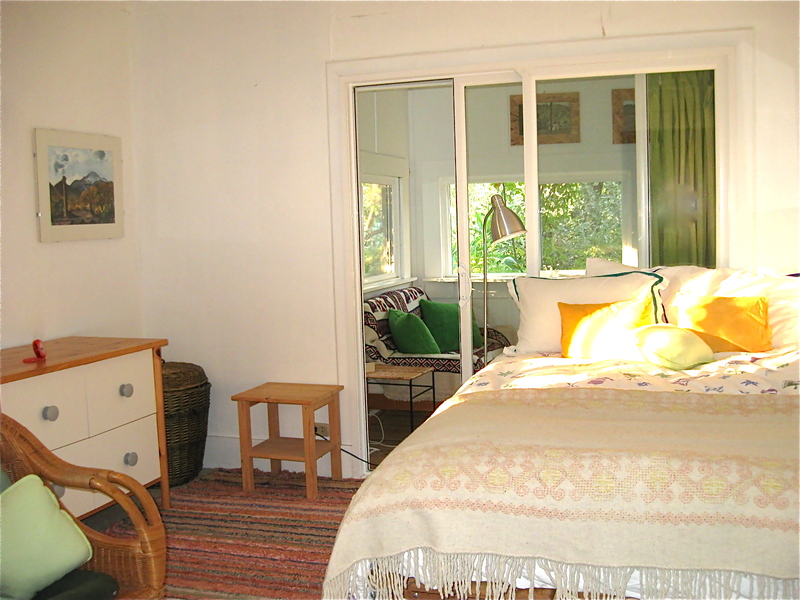 Extra Bedroom: This small light flooded room is joined to Bedroom 1 by a sliding door and can be used as a reading room. 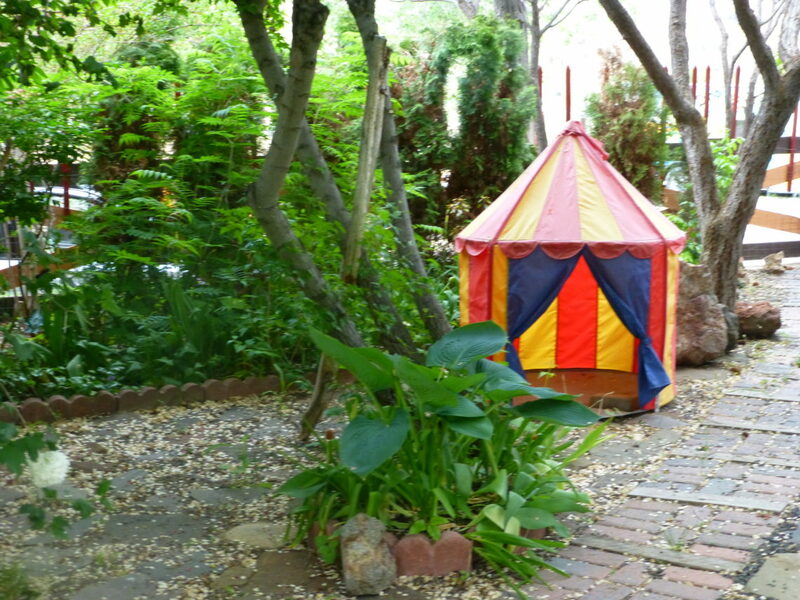 It has a cozy sofa hide bed that can accommodate 2 more guests. Gas stove with oven, coffee machine, coffee-grinder, rice- cooker, blender, refrigerator, toaster, Sensio espresso machine (bring the pads! 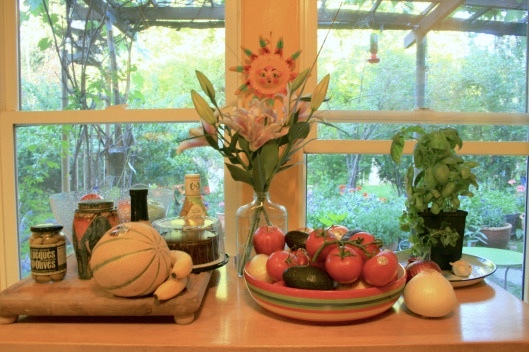 ),electrical water-kettle, gourmet cookware, utensils, dishes for 8, basic condiments, herbs & spices. Maximum occupancy is 8 guests.  Painted Hills Cottage: Charming, unique, comfy, clean, many great amenities, fantastic garden, wonderful host with lots of valuable info. We will be back and tell our friends about this gem! What a phenomenal place!! That garden is almost as epic as the Painted Hills themselves! So many flowers in bloom! 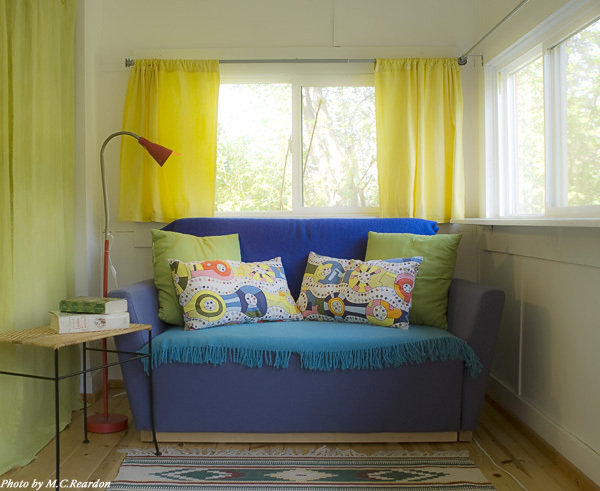 The cottage is so fun and whimsical, I felt like a kid inspecting all the Nooks and crannies. I cannot wait to visit again! And bring more people!